Big B Agro’s history began with farm fuel delivery. Company founder John Behrends began his career in Logan County operating a service station and delivering bulk farm fuels to the area farmers. Given the opportunity in 1974 to purchase property and equipment, John launched Big B Agro and today we continue his legacy of delivering quality products at competitive prices with the service you deserve! We are proud to offer a full line of top-quality fuel products to promote optimal operation during your hectic farming seasons. All of our diesel products are treated with the “Power Max” additive, truly making them the best premium diesel fuels marketed in the area. When you need fuel for your equipment, you can always count on Big B Agro’s prompt delivery and reliable customer service. Your farm equipment is valuable; protect your investment by using only the best oils and lubricants to keep your machinery operating at its peak performance. Our customers enjoy access to Chevron’s complete collection of oils and lubricants. Chevron’s brand is considered one of the best in the industry, based on performance, value, and quality. Having the proper equipment to store and transfer your fuel can be as important to your farm operation as the fuel itself. 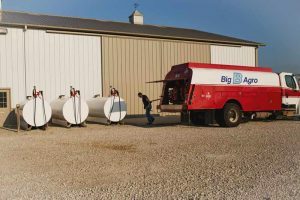 Let Big B Agro’s experienced staff help with storage tank setup and maintenance of your current equipment. Whether you need a new tank or pump, or a replacement for your filter, hose, or nozzle, Big B Agro’s service is just a call away.